The degree of blindness varies from total blindness to partial blindness (cloudy sight, ability to differentiate between light and shade, tunnel vision) in much the same way that human blindness varies. Usually the loss of sight is gradual and the cat compensates gradually so that you don’t even realize how bad its sight is. Sometimes illness or injury necessitates the removal of one or both eyes. Sudden blindness is more noticeable because the cat is disoriented, hesitant when walking, bumps into things and may vocalize more often (some cats appear to listen for sound echoes). Where a cat becomes suddenly blind it may develop unusual behaviors until it learns to adapt. It may be unwilling to leave its sleeping area and may develop inappropriate toilet habits because it is unable to find the litter tray. It will be reluctant to go outdoors to toilet. It may appear withdrawn and call out (when disoriented or in need of reassurance). To test your cat’s vision, cover each eye in turn and see if its other eye can follow a moving finger or responds to a finger moving towards the uncovered eye. You can also test its response to a torch (flashlight) being flashed on and off in the direction of the eye, but this is not 100% accurate since blindness is not always seated in the eyeball itself – the pupil may respond to light, but the normal ‘vision signals’ are not correctly processed by the brain. 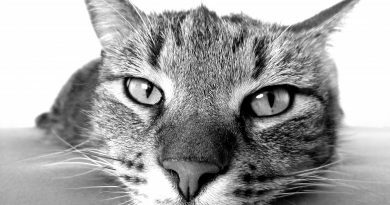 A cat blind in one eye may lash out in self-defense at sudden movements on its blind side. A cat with unilateral blindness may turn its head more often in order to compensate for the reduced field of vision. It may also have problems with depth perception since it has lost the stereoscopic area of vision – one-eyed cats often take several ‘sightings’ of a chair (etc) before jumping onto it, but quickly memorize the heights of such objects for future reference. Fully blind cats may clamber onto things rather than jump, but many also memorize heights and distances which is why furniture should not be rearranged and obstructions should not be left on the floor when there is a blind cat in the house. A blind cat is easily disoriented and should not be allowed to roam; indoors only or indoors with access to a fenced pen or garden is best. It may enjoy supervised forays in the garden using a harness and lead. Make sure it is wearing a collar stating its address and disability in case it escapes. If it is allowed to roam freely and is chased by another animal it may become lost or run into the path of traffic. Because it relies so much on scent/sound, a lost blind cat will probably be unable to find its way home once it is beyond its normal territory. Blind cats rely on scent and memory to find their way around so keep furniture in the same place and don’t leave obstacles in unexpected places where he could walk into them. If he is prone to bumping into furniture, try padding table legs and chair legs with old pillows or some foam to reduce impact damage. While most blind cats soon memorize routes and distances, not all manage this feat and rely on ‘bumping into’ their signposts. Whiskers become more important to blind cats to judge the cat’s proximity to an object. This means they are subjected to more wear and tear than normal and can be broken or even worn down! Sound is also important to a blind cat. Noisy toys such as balls with bells in, a noisy paper sack or a scrunched up paper ball will provide stimulation. Many blind cats learn how dribble scrunched paper balls or jingly toys. Carrying a blind cat around can disorient it so if you must move it, place it somewhere it knows well such as its feeding or sleeping area so that it can easily get its bearings. Don’t move its litter tray or feeding areas around, it needs to find them easily by memory or use them as landmarks. Don’t lift a blind cat onto raised surfaces as he will probably be disoriented and fall off. This might not apply if he is being lifted onto a familiar surface such as a favorite chair or your bed. If the owner takes care to provide a safe, stimulating environment then a blind cat or kitten can have a life which is a rich and happy as any sighted cat. Because blind cats are often able to adapt so well to the absence of this sense, many owners of blind kittens do not realize that the kitten is blind for some considerable length of time! There are also numerous reports of blind cats with access to outdoor enclosures successfully hunting birds and small mammals using scent and hearing alone. Interestingly, other cats are often more tolerant of blind cats (which may collide with them) than they are of sighted cats. A caring owner can think of other ways in which to help a disabled feline companion, but beware of being overprotective. A disabled cat still requires some semblance of independence to allow it to fulfill that inner ‘catness’ that we love in our feline friends. Most seem unaware of their disabilities and they do not expect life to make allowances, but a helping hand and some adjustments to their lifestyle and perhaps your own lifestyle will ensure a disabled cat has a healthy, happy and safe life. Is Your Cat at Risk of Diabetes? 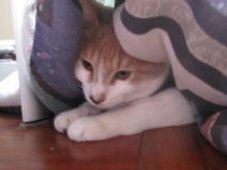 Jun 29, 2017 admin Comments Off on Is Your Cat at Risk of Diabetes?